Club chairs are heavily upholstered chairs with arms and a low back, traditionally covered in leather, which was normally dark green or brown in colour. The club chair has its roots in 19th century English gentleman's clubs, but today can be seen in many settings including hotels and commercial premises. A club chair is a classic piece of furniture which can be seen in many situations and locations, club chairs have always, and still do, serve as the ultimate socialising and relaxation furniture. To many people club chairs evoke a picture of mahogany panelled rooms filled with cigar smoke demonstrating heavy, masculine wood and leather worn to a comfortable patina. The popularity of the club chair during the 1920's period took a huge step forward when the chair began to take on a less masculine shape to the many different models that we see today. The modern club chair evolved from the original single style of buttoned base, straight back chair, covered in leather and deep buttoned. 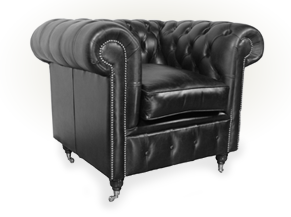 However looking through the pages of specialist makers of leather furniture, you will now find many that are available. Examples of some of the many styles include; placing a cushioned base on a standard frame, using different styles of legs, different button patterns, or changing the shape of the club chair completely. Unlike the time when the club chair evolved, now the leather finish that is available can have a dramatic effect on the finished appearance of a chair, the styles and colours are almost endless. There are also different finish options available on all the styles of club chair, such as different stud types, different wood finish colours, maybe a velvet covering or other fabric styling to match the decor of the room. Choosing a club chair which is right for you is dependant upon your personal likes and dislikes. Many people feel that the club chair should always be a tightly sprung and fully buttoned interior in a dark colour, others may prefer comfort and for them the overstuffed Kendal club chair which emulates its 19th century predecessor. The range of club chairs is wide but what the buyer should look for is quality and this is to be found in how the chair is made, this should be like a building with a solid foundation. The frame of the club chair is the most important part and this should be manufactured from a low knot selected hardwood and the component parts screwed and dowelled in a traditional manner. A ten year guarantee would be normal for a club chair made to these standards.